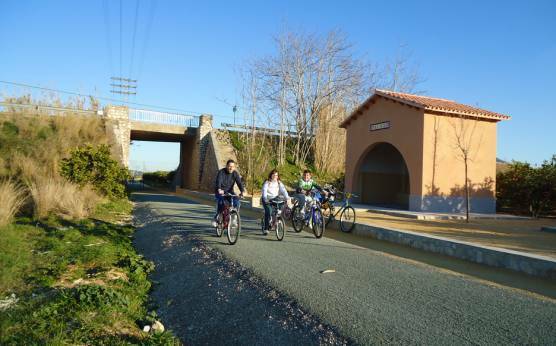 The "Vía Verde" (Green Route) of Dénia is based on the railway route which connected Dénia-Gandia and comprises part of the Dénia-Carcaixent line, the oldest narrow railway track of the peninsula which operated for 90 years. The first Gandía-Carcaixent section dates back to 1864 and began to operate as a tram with animal traction, subsequently in 1884. it was extended up to Dénia, converted into a steam traction train track. It was a train with a mainly agricultural use whose management changed hands among several operator companies. The Gandía-Carcaixent section was closed in 1969 because part of its route was replaced by the modern local train lines and the second Dénia-Gandia section was closed in 1974 when the tracks were ripped up with the hopes of its reopening as a wide railway track also as a local train line. After years of abandonment, these sections were recycled and conditioned by the Ministry of Environment, Rural and Marine Environments in the framework of the Natural Roads program. Camino de Pego, next to the Natura Garden garden centre. The connection with the town centre is currently in the planning stage. 6 km (one-way). Linear path. On foot 1 h 40 min Bicycle: 35 min. Entire route is wheelchair-accessible. 2 reserved parking spaces at the start of the rail trail. It runs along the rail trail of the old railway line between Dénia and El Verger. Alternate itinerary for getting to beach areas. Cyclists ride along an asphalt roadbed while walkers walk on a compacted dirt road. Vehicle motor traffic is prohibited from the start of the rail trail to the Alberca River footbridge. Route passing through orange groves, rural dwellings, manor houses with nearby groves and pine forests. Footbridge over the Alberca River. Different species of Mediterranean trees have been planted along the length of the rail trail. Rest areas, exercise zones and lookout points. Informative panels on the interpretation of the landscape and history of the old railway. While we discover a little-known agricultural landscape that witnessed the passing train, the Segaria Mountain grows larger as we near El Verger. However, if we approach Dénia the Montgó Mountain becomes bigger as the backdrop framing our journey. The rail trail ends close to the towns of El Verger and Els Poblets. 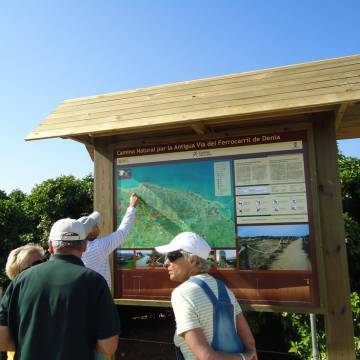 The cycle path toward Pego starts in El Verger, and allows us to venture into the Marsh Nature Park and reach Oliva. This route does not have any specific signs. From Oliva we reach Gandía using the Safor rail trail, converted upon the same stretch as the old Dénia-Carcaixent railway line.